Volume 2 of the book “Beyond Diet and Depression” offers in-depth knowledge about depression and its alleviation through dietary interventions as described briefly in Volume 1. This volume is intended for the benefit of the general public and the entire medical community interested in the effective clinical management of depression of diversified origin and to improve the therapeutic success through dietary interventions and other recently developed novel and disease-specific biomarkers for personalized treatment. This book is devoted particularly to provide recent knowledge about important healthy diets and their therapeutic potential in depression. In addition, it covers various clinically-significant aspects of disease-specific depression and its alleviation with specific dietary interventions. This volume highlights emerging knowledge about major depressive disorders (MDDs) with limited treatment success at the the moment. Volume 2 consists of three parts. 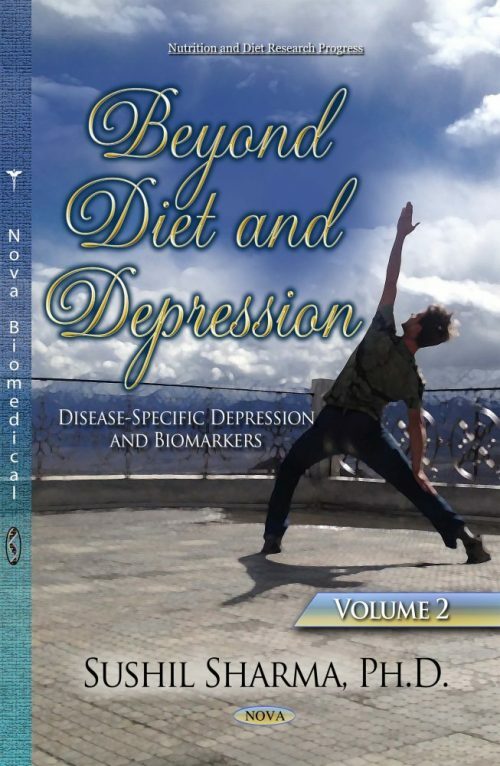 Part I describes various types of diets and depression; Part II describes disease-specific depression and its alleviation with specific dietary interventions; Part 3 describes recently discovered novel biomarkers and their clinical significance in diagnosis and personalized treatment of depression. This volume is written with a primary objective to highlight the clinical significance of specific dietary interventions early in the course of treatment and provide neuroprotection by inhibiting hippocampal and hypothalamic Charnoly body (CB formation) primarily involved in the etiopathogenesis of depression. CB is a universal preapoptotic biomarker of cell injury which is formed as a consequence of free radical overproduction during nutritional and/or environmental toxic insult in most vulnerable (stem) cells. CB formation is involved in progressive neurodegeneration and depression as a consequence of compromised mitochondrial bioenergetics. A detailed description of CB formation, its prevention and/or inhibition by antioxidants and/or pharmacological agents is provided in this volume for the effective treatment of MDDs. In addition, this book provides recent knowledge regarding emerging novel biomarkers and their clinical significance in the differential diagnosis, prognosis, and treatment of depression. There are numerous anti-inflammatory, antiapoptotic, growth-promoting antioxidants in our diet including flavonoids and polyphenols which can enter CNS without any allergic reaction about which limited knowledge is as yet available. This volume provides further insight along these directions and emphasizes the significance of tryptophan rich diet, omega-3 fatty acids, B-Vitamins, Vitamin D3, minerals, and antioxidants for healthy living at any age.